Another 99p ebay purchase thumped through the letter box the other day. I've collected a few out of interest; to see if they are worth working with, as they are very cheap. I can get them working OK but they are never as good as my Record 5 1/2, which seems to be the best plane in the universe. So can anyone tell me; obviously they are never going to be as convenient, but can they be made to cut as well as a metal plane? Or is the best you can expect just a usable but inferior tool? The wood ones I use most are the jack planes, and the rebate. The rebates are little crackers, it is astonishing how fast and efficient they are especially with a skew blade. I have 4 wood jack's set to scrub, coarse, medium, and fine, just pick whatever is required rather than alter blade depth each time. Plus a big heavy matheson oak jointer to shoot boards for made up seats if I need to. I havent had so much success with moulding planes. mrspanton wrote: The wood ones I use most are the jack planes, and the rebate. The rebates are little crackers, it is astonishing how fast and efficient they are especially with a skew blade. I have 4 wood jack's set to scrub, coarse, medium, and fine, just pick whatever is required rather than alter blade depth each time. Plus a big heavy matheson oak jointer to shoot boards for made up seats if I need to. I havent had so much success with moulding planes. Oh yes I'd forgotten about the rebate planes. I borrowed Brian's Ulmia some time ago viewtopic.php?f=5&t=2814. Excellent tool. Yes I take your point about having them to hand for different uses. Then the 5 1/2 or 4 1/2 just for smoothing and fine finishing. I think the moulding planes are handy if you do a lot of restoration work or you just want to run small lengths of mouldings. I have found the wider the moulding plane the harder to control. wooden planes with hard soles are suggested to clean the wood better because of the way they rub the wood after the cut. however, the biggest problem with the older ones is adjusting the wedge properly so that it both holds the blade tightly, but does not push it too far down as you tighten it. the german ece planes with their adjustment are a decent modern compromise of the benefits of a wooden plane, and the easy set up. because i find accurate wedging the blade difficult, i don't use my various ones as much as i should. I have had good luck recently with a bunch of woodies. OK, 2 out of the three I made, and the third I picked up on eBay. However, I had a recent win on eBay. The blade was nearly used up, but I honed it is and it has proved to be amazing in the edge it takes and holds. There is a nice story with this one. Here is a link ..
mtr1 wrote: I think the moulding planes are handy if you do a lot of restoration work or you just want to run small lengths of mouldings. I have found the wider the moulding plane the harder to control. I found that it helps greatly to use very good quality, clean, straight grained stock to make the muldings. Less problems with tearout from wild wavy grain, even when the plane is use "downhill" all the way along....when it does work sweetly though its very satisfying to see the moulding appear. I reckon a lot of the old moulding planes (ones with a shaped profile not standard hollows and rounds) are warped and stuff. Sharpening a profile is tricky too, without ruining it. The only disappointment is the blade. This is a well-used Scottish Alex Mathieson & Son. It is a puzzle for me that such a worn iron is fitted to this crispy plane. Derek that's a brand-new modern style amateur-made plane with an old blade. Or I'll eat my hat! Like the story, sorry to be a party-pooper! Jacob, I'm pretty sure that the plane is new. The question is "when was it made, and where?". My guess is that it was made in South Africa and brought to Australia very recently. I think that it is genuine in terms of where it comes from, but that it was made fairly recently. It is inconceivable that someone went to all that trouble to fake a plane (which is pretty well made), and then sell it in Australia where it would draw a very small audience of those interested. Recall, I only paid $26 AUD (14 GBP). The blade is 2 1/8" wide, which is an uncommon size. I would say that the plane was built arount the blade since it fits the mouth perfectly. A full length tapered blade would be too thick. I am on the look out for a suitable replacement, and will then need to open the mouth. Anyone have a decent 2 1/8" blade? I have honed the blade and it is fantastic - I would say that there is plenty of life in it in spite of its looks. Actually, it makes sense. 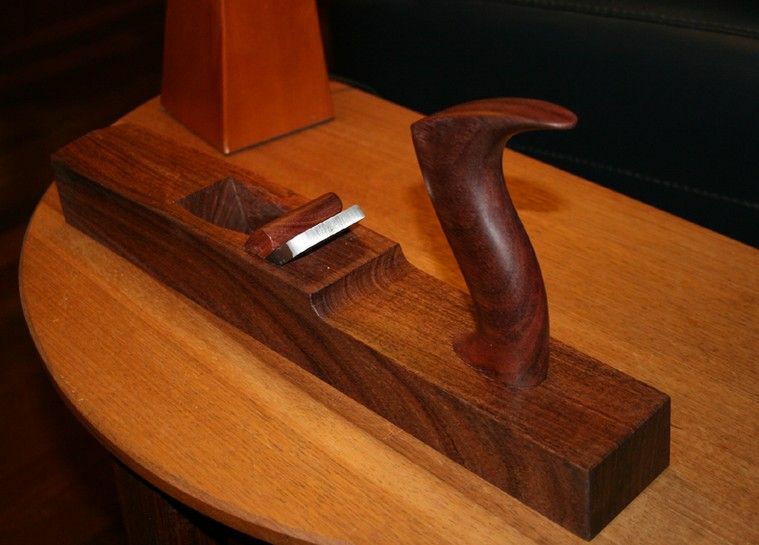 Steve Knight has been making planes this way for a while. derekcohen wrote: Jacob, I'm pretty sure that the plane is new. The question is "when was it made, and where?". My guess is that it was made in South Africa and brought to Australia very recently. I think that it is genuine in terms of where it comes from, but that it was made fairly recently. It is inconceivable that someone went to all that trouble to fake a plane (which is pretty well made), and then sell it in Australia where it would draw a very small audience of those interested. Recall, I only paid $26 AUD (14 GBP). whop de doo, Steve knight is the plane god why did nt they make laminated planes traditionally then, if its so good a method? I cant think of any old makers as used that method. Apart frtom obviously easier to fashion the bed for the iron etc? They didn't have modern glue. Also they had a well established tradition for making single-piece bodies so there would have been no reason to change, until the traditional chain was broken. You are referring to Clark & Williams. They make one-piece traditional woodies. Then, again, Jim Krenov inspired a generation of laminated planes, and managed to make them work reasonably well. Old Jim hasn't inspired me yet. I'm still waiting! Salmen 404. 2 1/4". 1944. Same age as me - must be good! Didn't seem to have done much (another coincidence!) but may have spent part of it's life in a pond, to judge by the dried out appearance and the badly pitted (Tyzack hardly used) blade. 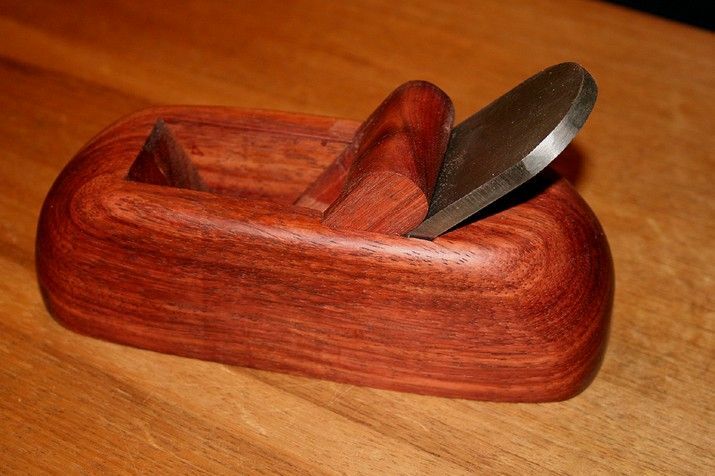 It works OK but however I try to improve my wooden planes' performance, they just aren't as good as metal planes. Which of course is why they have largely been abandoned and are available on ebay for 99p. Had a look - it's not entirely clear why old ones were better. More a case of better ones are better. BTW re my 99p plane appearing to be little used. I've met this before with old planes and the reason was the same - it was simply unusable . In this case the mouth was too tight (relieved by planing the bottom) and the cap iron had a square end which meant shavings compacted against it instead of gliding past. A quick filing did the trick. I've been using it this morning. It's improving. They do - it's almost like training them up. You bash away with a hammer or a mallet to get the set right until eventually everything settles in and needs less bashing. mrgrimsdale wrote: it's not entirely clear why old ones were better. More a case of better ones are better. it's almost like training them up. You bash away with a hammer or a mallet to get the set right until eventually everything settles in and needs less bashing. Mistreated as a lad, then Grim? Bashing you up that chimney? Never did me any harm (except for the brain damage and the scars). And the sole needs training up too. I think newly planed surfaces are softer. It's only with use, linseeed oil and occasional fine smoothing, that the sole eventually becomes flat and stable, but never as flat and stable as a steel plane.